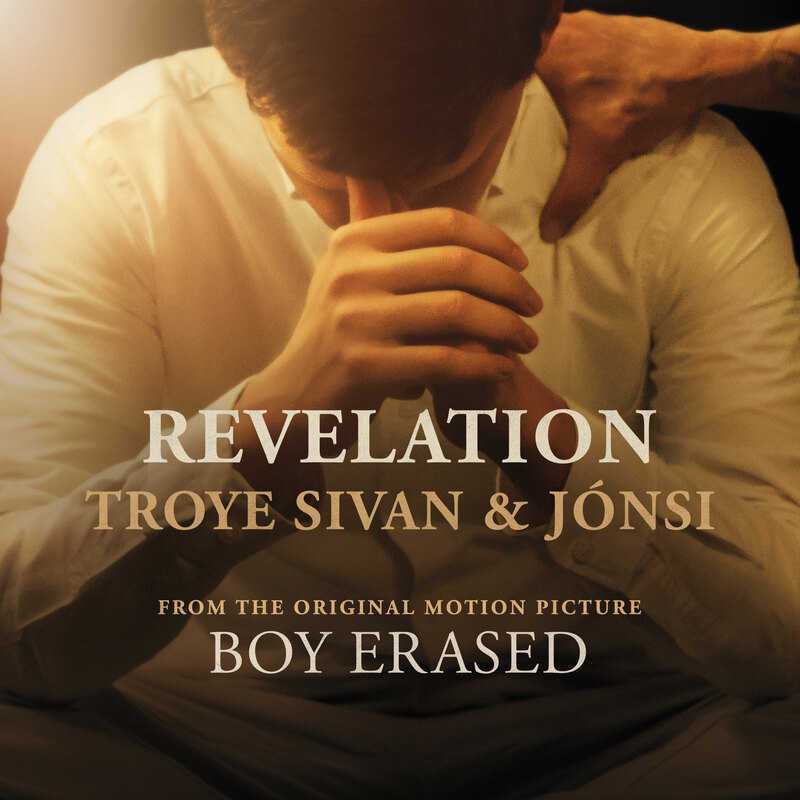 Focus Features and Back Lot Music announce the release of “Revelation”, the new original song by Troye Sivan & Jónsi written for the feature film Boy Erased. Fans can stream the song on all DSP’s or get the song instantly with soundtrack pre-orderhere. The soundtrack to the film – featuring an additional original song by Jónsi and score by Danny Bensi & Saunder Jurriaans – will release digitally on 10/26 and physically on 11/2 with the film’s theatrical release in select theaters nationwide. A vinyl component will be issued later this year with Music on Vinyl. Boy Erased tells the courageous story of Jared (played by Lucas Hedges), the son of a Baptist pastor in a small American town, who is outed to his parents (Nicole Kidman and Russell Crowe) at age 19. Jared is faced with an ultimatum: attend a conversion therapy program, or be permanently exiled and shunned by his family, friends and faith. Boy Erased is the true story of one young man’s struggle to find himself while being forced to question every aspect of his identity. Sivan also acts alongside Hedges as Gary, a fellow conversion therapy student. Sivan, who was born in South Africa and raised in Australia, came out to his family at age 14. Unlike the character of Jared, Sivan says “the only thing that saddened my parents was that I hadn’t told them sooner; that I was dealing with this alone.” He has since become one of the world’s most influential online superstars with the biggest social media footprint in Australia, and the fastest growing YouTube channel in the Australia/Asian market to date. He began his career as an actor staring opposite John Cleese in the South African franchise Spud. Sivan was recently hailed as “the Perfect Pop Star for 2018” by TIME, which pronounced his new album, Bloom (Capitol Records), as “a major artistic achievement.” Bloom was awarded four stars by Rolling Stone and has already racked up more than 700 million cumulative streams. Sivan’s numerous awards include a Billboard Music Award, three MTV EMA’s and two GLAAD Media Awards. His 2015 debut album, Blue Neighbourhood, topped the iTunes charts in 66 countries and has sold more than 2.5 million adjusted albums worldwide. Jón þor (Jónsi) Birgisson is an Icelandic musician, best known as singer of Sigur Rós, a band he co-founded as a teenager 24 years ago. With Sigur Rós he has released seven studio albums, which have taken the band on a journey from willful obscurity to a position as one of the biggest 'underground' bands on the planet, building a large and ardent live fanbase all over the world. Sigur Rós' beautifully atmospheric and often darkly dramatic work continues to defy categorization, attracting a truly broad spectrum of admirers, among them the many filmmakers. For film, Jónsi has previously written end title songs for How To Train Your Dragon 1 & 2, an award-winning score for Cameron Crowe's We Bought A Zoo, and TV drama Manhattan.